Cruise the streets of Alpharetta in a new C 300 from RBM of Alpharetta! Our dealership knows what Georgia drivers seek from a new luxury sedan, and why they continue to choose the C-Class vs. rival brands. We’ve gathered the finest inventory of brand new C 300 models, so take a look at our current selection and schedule a test drive in Alpharetta today! 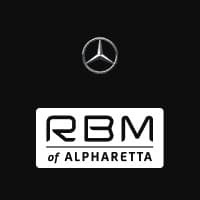 Why Buy a Mercedes-Benz From RBM of Alpharetta? With a potent engine and lavish interior features like MB-Tex leather, you already know the C 300 is a winning luxury sedan. In fact, the C-Class is the top-seller for Mercedes-Benz, and outsells its top competitor: the BMW 3-Series. You’ll enjoy all these features and plenty more for under 50K—quite a feat in the luxury segment! Contact RBM of Alpharetta today to schedule a test drive. As a 2016 Dealer of the Year winner, we are a top Mercedes-Benz dealer in Georgia—and the nation—and prepared to give you the star treatment.